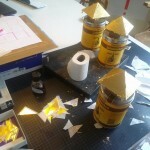 T h e G o l d e n H e a r t A r t distinguish themselves through the frequent use of 24 carat gold. On earth, in the material world, gold is the true representation of GOD. In addition the Golden Heart Art is characterized by her simplicity and near perfect shape. Further more is Love, as formed by Golden Hearts, a repeating element. The spiritual art and the used symbols exert a powerful influence on the heart chakra. Merely through looking your heart is filled with Love-energy. 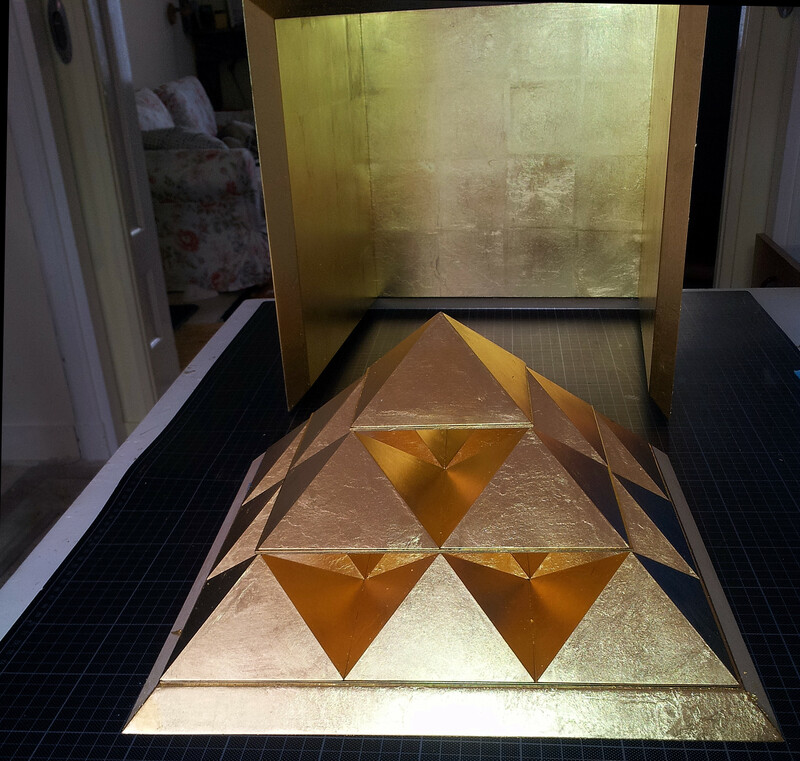 The following 3D spiritual art is based on sacred geometry and is made in cooperation with Aart Bol. © copyright Nenno de Zoete, Dordrecht. 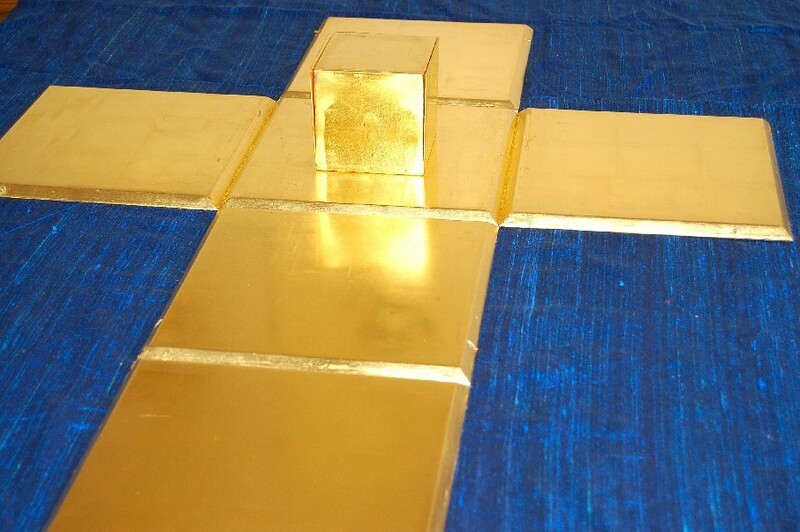 Aart Bol places a cube, formed by 6 golden pyramids, on the cross of Jesus. The applied spiritual symbols represent and picture, next to love, deep spiritual knowledge and wisdom. In fact they are powerful tools that inspire and “cleanse” man. Tools in such a way that the artworks are very suitable to meditate with. To describe your experiences when you look at an artwork, some words like joy, surrender, GOD, Unification and of course Love spring to mind. The exact experience is dependent upon the spiritual development of the individual and the meaning of the object. 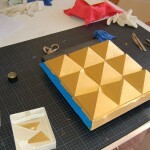 The 3D artworks are an integral part of the work of The Golden Heart. This work encompasses the gilding of man, the gilding of the heart. In fact transformation through alchemy. 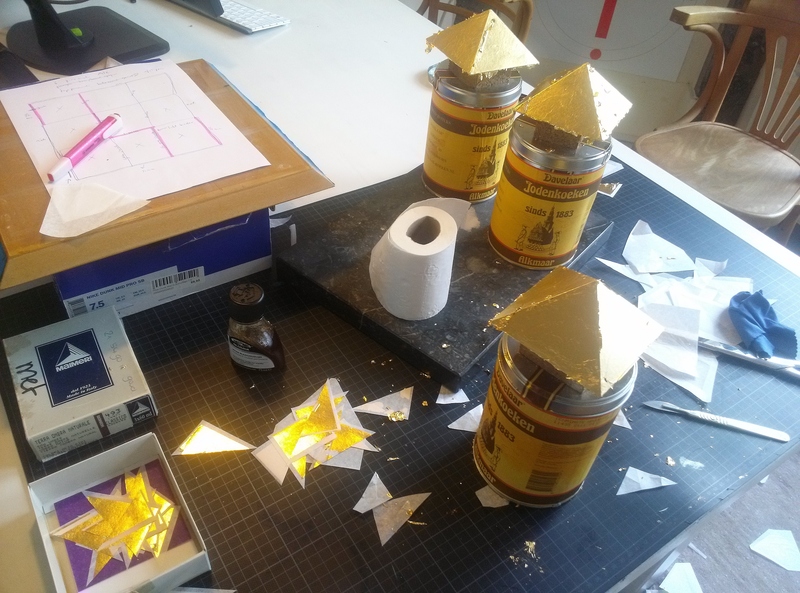 The Golden Heart artworks are Alpha – Omega. Their meaning and shape relate to the fundamentals of Life. What is represented is the essence of Life. The spiritual view is that all is Love and one can see this in the geometrical patterns in the core of life. Beyond the applied symbols all geometrical symbols cease to exist. What remains are the single dot and the circle. They are the ultimate perfect shape, the pinnacle of beauty, the GOD shape. 4 x i = (4 x eye*) makes a Cross. i am Life, i am Love, i am All, i am One. The circle symbolizes GOD just like the dot on the i. * Eye is iconografically the symbol of GOD. T h e G o l d e n S p h e r e pictures perfection and symbolizes GOD. 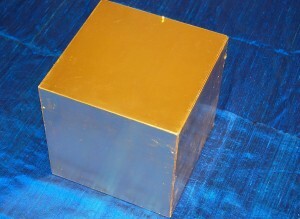 The cube is the symbol of the kingdom of man, the earth. Rama with floating golden sphere (11 x 11cm). 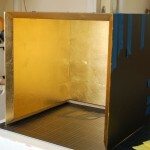 Cube (25 x 25 x 25 cm), € 2.800. Floating golden sphere (11 x 11cm). 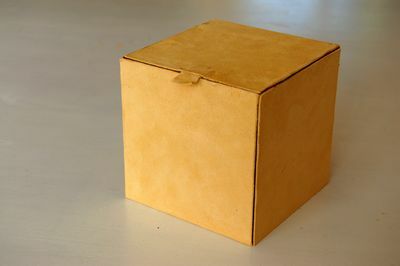 Cube (25 x 25 x 25 cm). € 2.800. 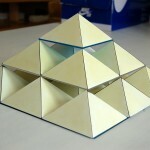 F o u r t e e n pyramids stacked together make one large pyramid which is placed in a cube of 33,3 x 33,3 x 33,3 cm. 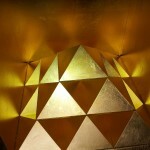 The pyramid is the symbol of transformation and provides transforming powers. Multiple pyramids increase these transforming powers. The 24 carat gold symbolizes GOD. The Cube represents the earth. 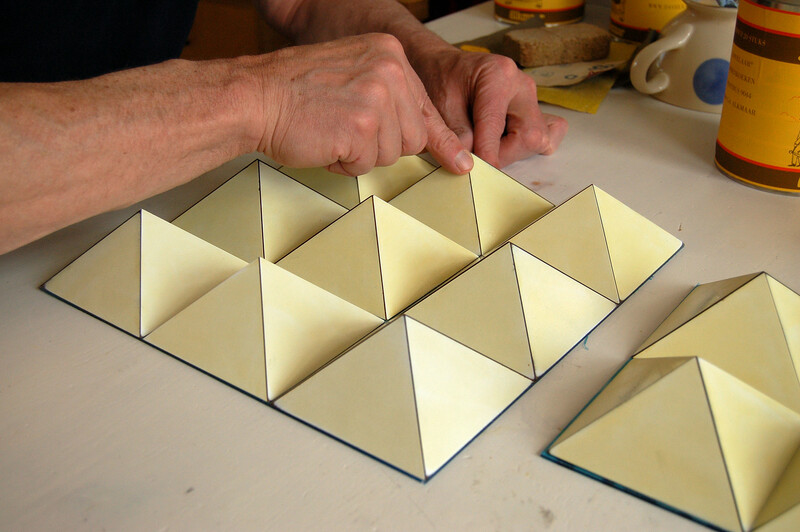 It is possible to place fourteen pyramids on each of the six insides of the cube. 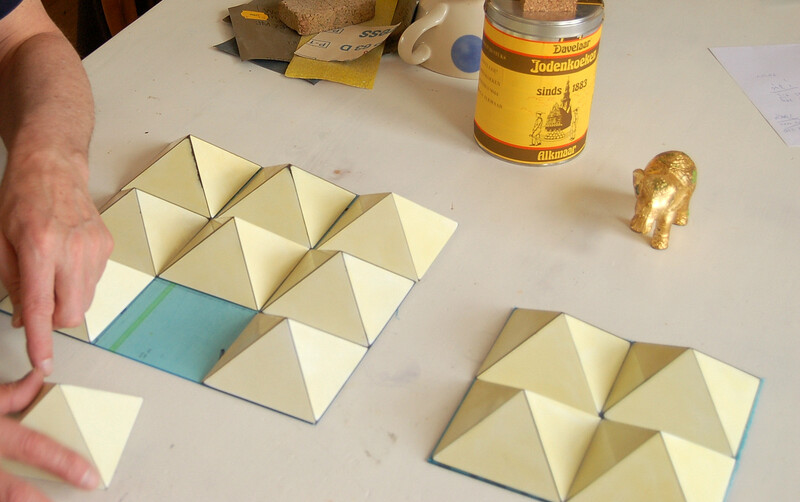 These six pyramids are joined at their pinnacle and form a new cube of 10 x 10 x 10 cm. 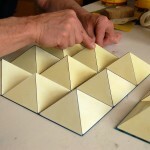 Opening the larger cube reveals a Jesus Cross with a stacking of fourteen pyramids on each side. 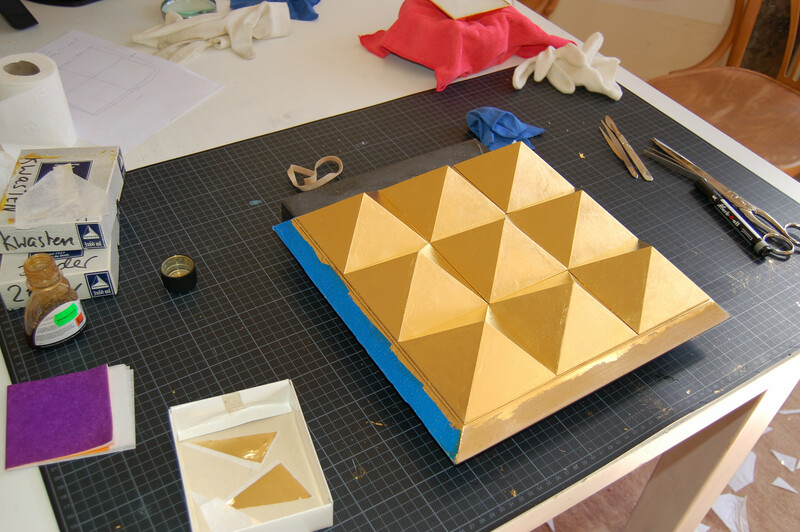 Transformation was designed and fabricated by Aart Bol and Nenno de Zoete. It was completed on April 10th, 2014. 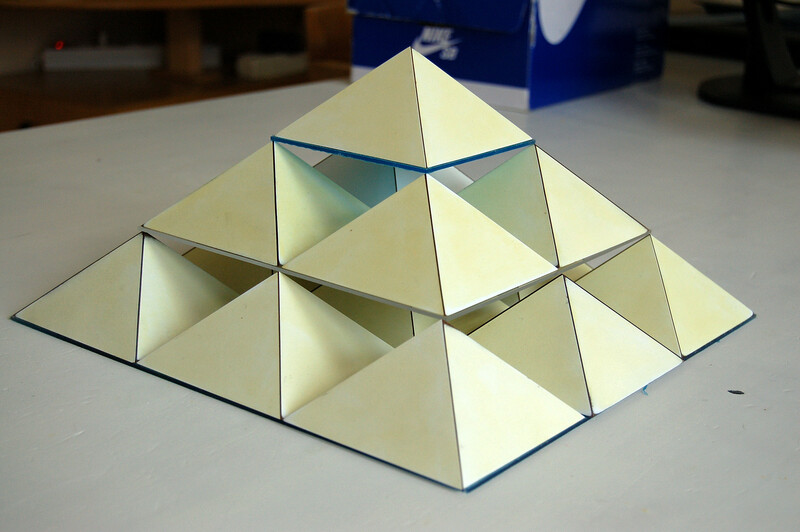 14 pyramids (each pyramid : 10 x 10 x 5 cm) stacked together make one large pyramid, € 5.500. 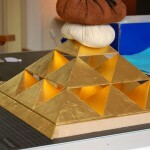 Fourteen stacked golden pyramids together form one golden pyramid in a cube of 33,3 x 33,3 x 33,3 cm. 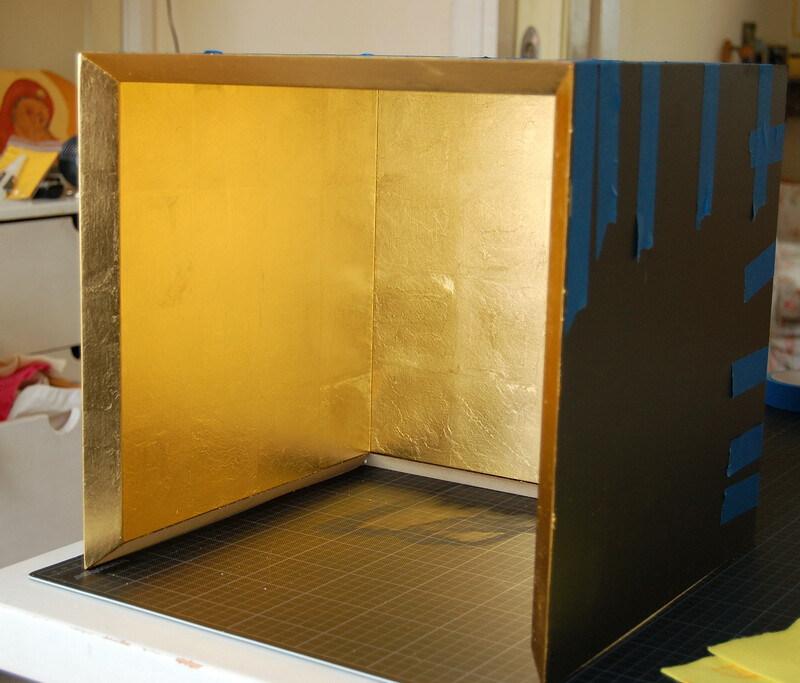 T h e G o l d e n G a t e . Gold and the lack of shape is the most direct way to God outside yourself. One sees nothing but 24 carat gold. It fills the heart only by looking. Receiving and transmitting at the same time, incredibly powerful and full of Love. It is my favorite work, my ultimate work and for me unsurpassed in beauty and effectiveness. It encompasses and tells all. Nothingness depicted and experienced. It truly represents the Alpha & Omega principle. 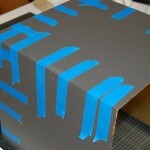 It also represents the transition of my 2Dimensional works of art to 3Dimensional objects. Above all, I experience the highest Love when I look at it. I feel myself overflowing with Love, deeply grateful and happy that I am. Eye-dentity & I-dentity, 3Dimensional (61 x 61 x 0,4 cm), € 1.900. A w o o d e n c u b e clad with suede leather 13 x 13 x 13 cm. 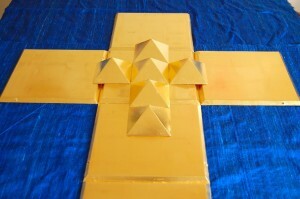 folded flat to a Jesus Cross. In the center of the cross one finds a golden pyramid of 10 x 10 x 5 cm. This cube generates force, wisdom and Love. 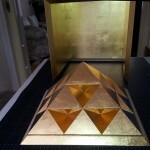 This happens through her special dimensions, her holy geometric and the right combination of cube, cross and pyramid. The cube symbolizes earthly live, the Jesus Cross stands for surrendering oneself, one’s own interests. The pyramid symbolizes the spiritual processes on earth. The Transition from 2 to 1, from duality to non-duality. 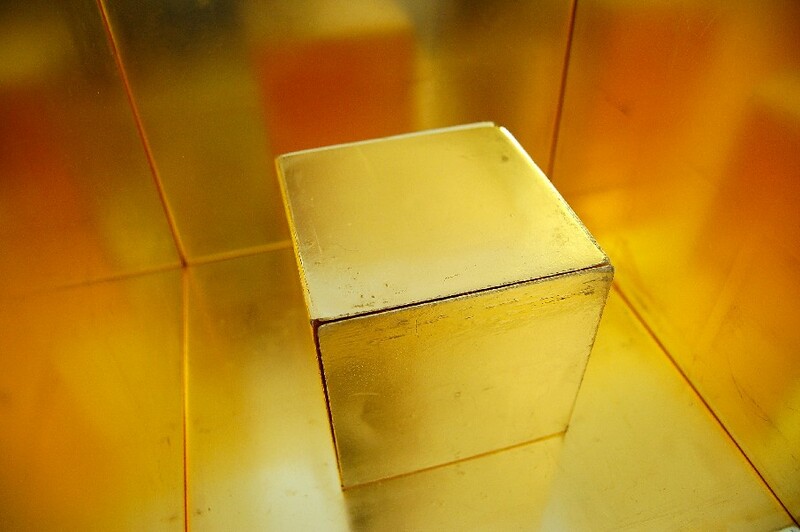 Besides the use of pure materials with their specific properties like the 24 carat gold, the cube also is charged with special energy that transmits continuously. Nearly everybody can sense this energy. That’s the power of this generator. 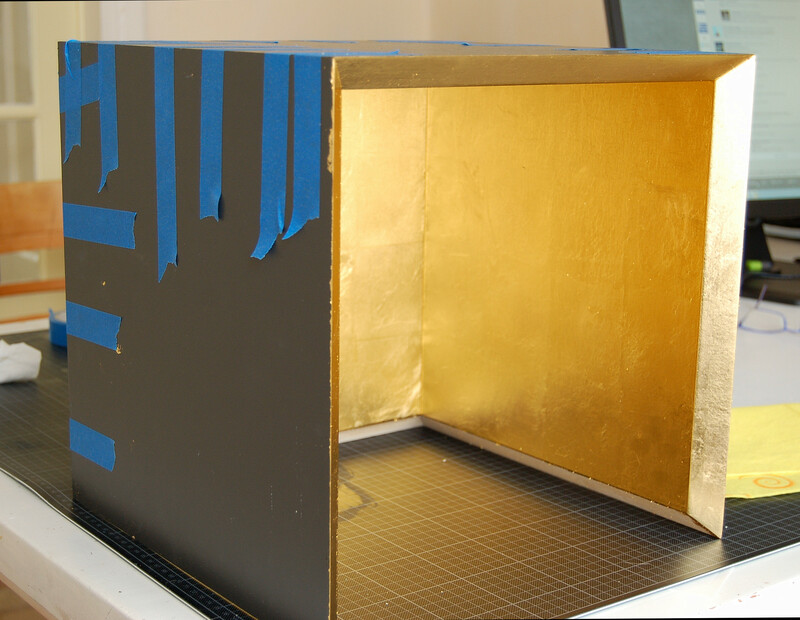 The generator is specially suited to meditate with, both in her cube shape or folded open as a Jesus Cross, to be placed in a living- or meditation room. The Force, Wisdom and Love generator, € 730. T h e G o l d e n G l o b e pictures perfection and symbolizes God. The cube stands for the human realm, earth. 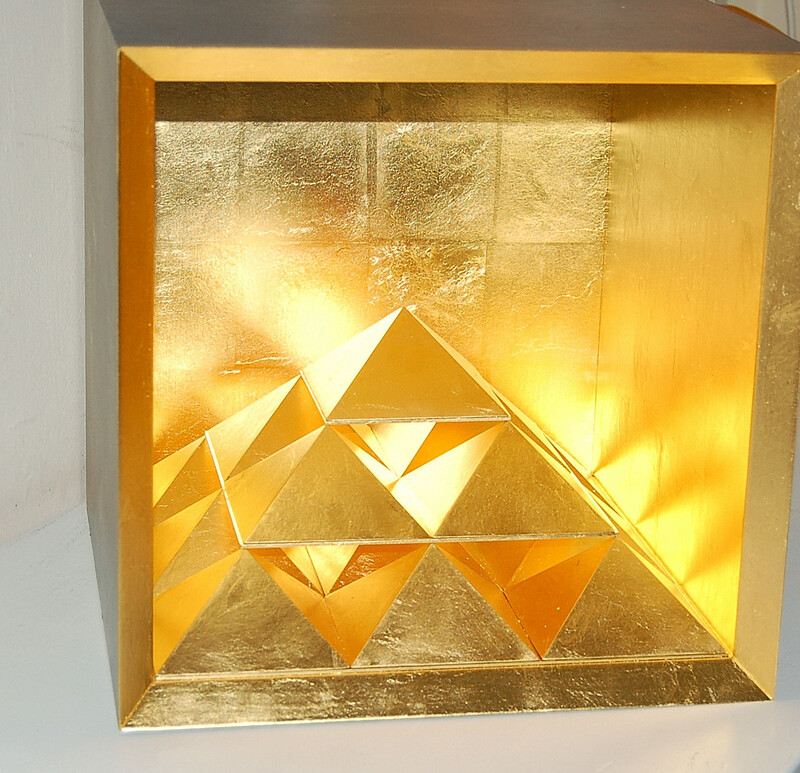 Golden globe (9 x 9 cm) in golden cube, (23 x 23 cm). Not for sale. Golden cube (8 x 8 cm), the inside of the cube (25 x 25 cm), € 1.900. T h e C u b e . Below one finds five illustrations depicting a spiritual path. The large cube is the New Earth, a cosmic abode which a human reaches when one has completed one’s spiritual development and enlightenment. On the New Earth this enlightenment is further developed. On earth suffering and Love are the core and engine of the spiritual transformation. Illustrations below are from the first design. Completion is therefor not yet perfect. By opening the smaller Golden cube inside the larger cube one sees a Jesus Cross with a golden pyramid on each of the six sides of the cross. 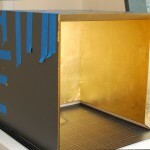 The photographs above depict the unfolding of the small cube. 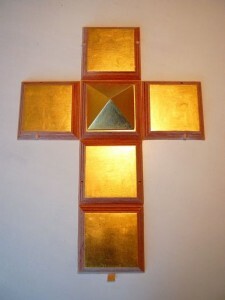 Golden cube shaped by six pyramids on the Jesus Cross, € 5.500. T h e b a s e o f t h e p y r a m i d , a square, visualizes the limitations of life on earth. 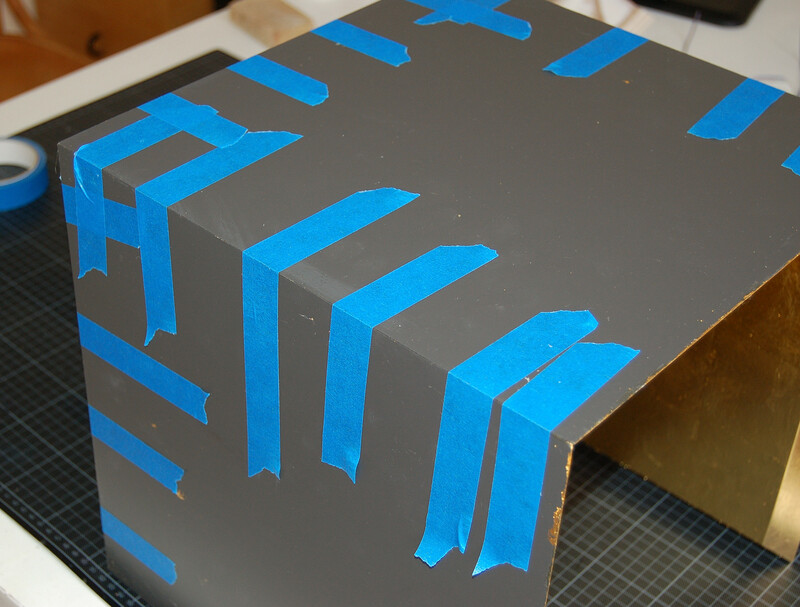 Of interest is that every corner of the square is 90 degrees, thus the four corners together are 360 degrees. This shows the similarity with the godly circle. 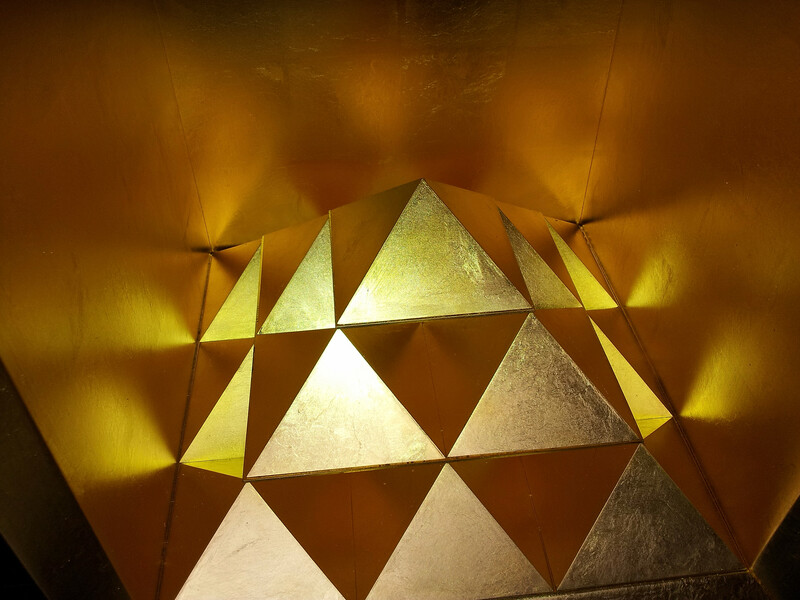 The four sides of the pyramid, the four triangles, depict the essence of the human spiritual development. 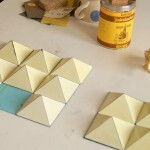 The two angles at the base of the triangle stand for duality. The polarity on each side of the triangle and inside man. Man himself has to reduce this duality to 1, from 2 to 1. 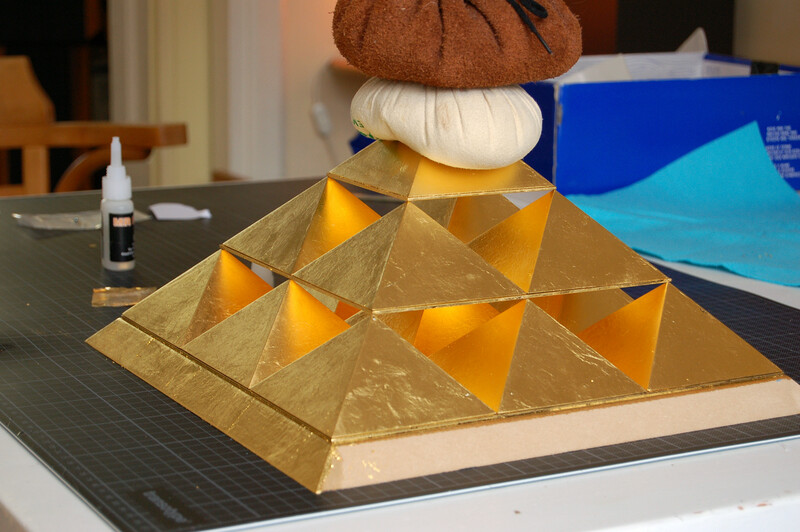 The uppermost angle of the triangle, to the pinnacle of the pyramid. The four sides of the pyramid tell us that man himself must experience all aspects of himself and thus transforming to 1. But it also points to combinations on earth: the four primary colours, the four compass directions, North, East, South and West. The four elements of life, Fire, Water, Earth and Air.